USDA Hardiness Zone 6 extends in a wide belt through the United States, passing through such diverse states as Massachusetts, Pennsylvania, Tennessee, Missouri, Texas and New Mexico. Gardeners in Zone 6 must wait until frost danger has passed to plant string beans. Most bean varieties will perform in Zone 6. String beans also are called pole beans or green beans. Popular varieties include Kentucky Blue, Blue Lake, Wax Bush, Goldenwax or Triumph. Boost the nutrient content of the soil naturally before planting string beans in April or May, once the frost danger is nearly passed. Apply 2 inches of compost or manure in an even layer across the top of the soil. Turn the manure or compost into the soil with a shovel to help the beans get enough nutrients to grow. Prepare a 1-inch deep row for planting the string beans. Space green bean seeds in the row 4 to 6 inches apart. Follow the seed packet instruction for the correct planting depth. Cover over the row with soil. Leave at least 30 inches of space between rows of beans. Water the newly planted string beans until the ground becomes saturated. Check the water level every day until the seeds germinate, typically within one to two weeks. Keep the soil moist but not soggy. Water as often as necessary to achieve this. Prepare a trellis for the string beans. Sink two wooden poles into the ground at the ends of the rows. String mesh netting between the two poles. Secure the netting to the poles using zip ties. Train the new bean shoots up the netting by hand. 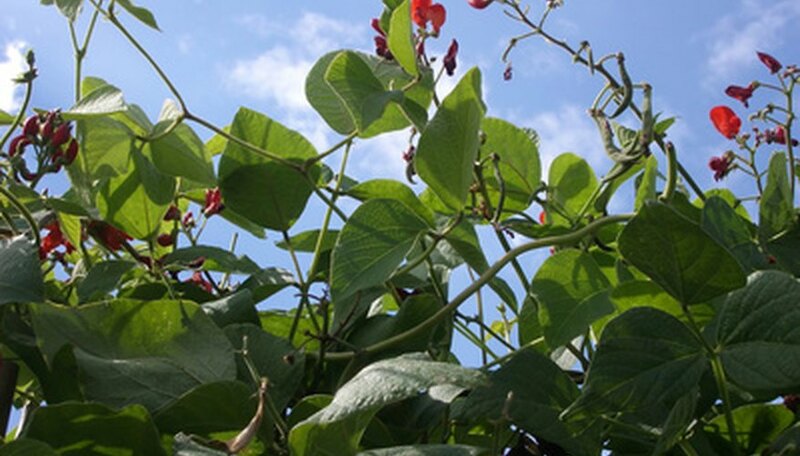 Continue t train the beans until the vines are sturdily trellised at the base and naturally climb on their own. Weed out competing shoots that grow elsewhere. Pull any other growth out by hand. Continue to water the area when the bean seeds have germinated. Water until the soil becomes moist. Allow the moisture to sink in. Water again when the soil becomes lightly dry. Harvest the green beans when they are ripe, usually in 55 to 65 days.